Christmas is almost here and these Baked Brie and Prosciutto Rolls are the main event on my appetizer table this year. I really can’t believe it, but somehow we’re just days away from what is arguably the biggest holiday of the year. And like every year, I am so excited. My family is slowly beginning to arrive, the brothers (and friends) have slowly been making their way down to my house come five O’clock for snacks…and drinks, and it’s finally starting to set in that the holidays are really here. I finally started planning out my holiday recipes yesterday, and I decided these cheesy rolls are my perfect appetizer. In fact, aside from my usual cheese board, these brie and prosciutto rolls are the only appetizer I plan to make. I’m not huge on doing a ton of appetizers/snacks because whenever I do, everyone is always full by the time dinner is ready. Anyway, maybe what I’m really trying to say is that this is my Christmas Eve appetizer, and I’m pretty happy to be sharing the recipe with you guys today. 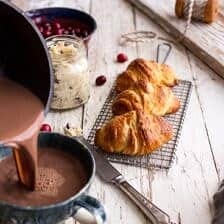 This is one of those back pocket recipes that’s PERFECT for having on hand when you need something easy and delicious to make when entertaining. This recipe has a total of seven ingredients, and honestly, these rolls are just too good for words. 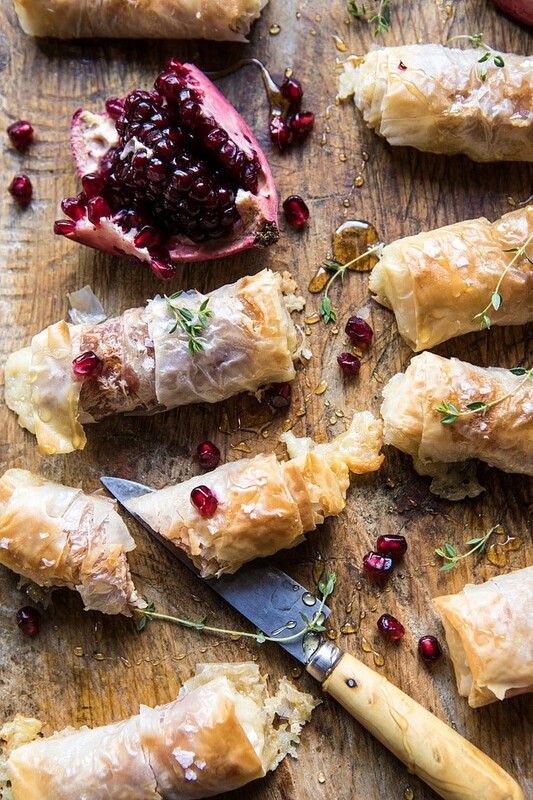 Flaky phyllo, Brie, and prosciutto. I mean, that’s a pretty heavenly combo. If any of you own the Half Baked Harvest Cookbook (psst, psst, today is the last day to order for Christmas delivery…hop to it already! ), then this recipe might look a little familiar. I have a recipe in the book that’s similar to these rolls, but the recipe in the cookbook uses provolone and salami. It’s such a go-to recipe for me that I decided to make a “holiday” version with two of my favorite “holiday” ingredients, brie and prosciutto. If there was ever an appetizer that almost everyone will love, it’s got to be these rolls. 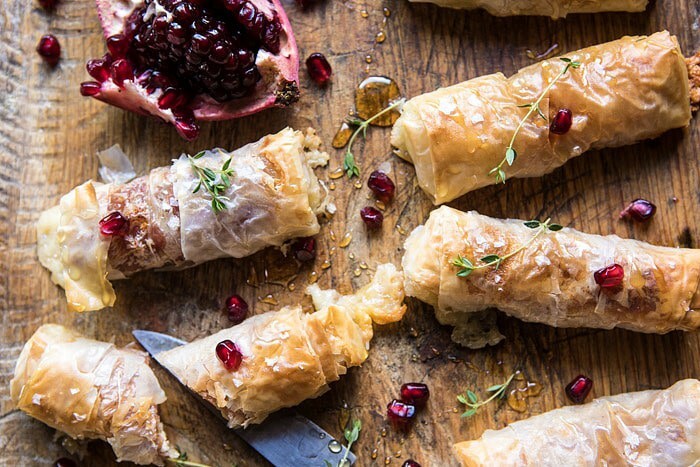 They’re flakey, filled with Brie, salty prosciutto, and finished with a touch of sweetness, thanks to the additions of honey and pomegranate jewels (or at least that’s what I like to refer to them as…because they really do look like the prettiest red jewels). These are the perfect hand-held bites for any holiday gathering/party, and they’re extra great because you can prepare them ahead of time and then just throw them in the oven right before guests arrive. 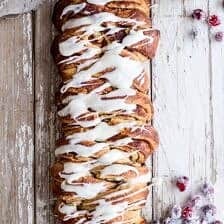 To make things even easier, I like to serve these rolls right off the baking sheet, drizzled with honey and topped with pomegranate arils and fresh thyme. The toppings are so pretty that transferring the rolls to a serving plate really is not necessary. Plus, some of the Brie oozes out onto the baking sheet while baking, and trust me, you’ll want to eat up every little bite of that melty Brie. YUM. As mentioned, I plan to serve these for my family’s Christmas Eve dinner, which apparently is not even happening at my parent’s house this year. I’ve been told that the whole fam is headed to a nearby friend’s house…but it’s a potluck, so I’ll still need to bring a few dishes. Hmmm, this should be very interesting twist to our usual festivities. 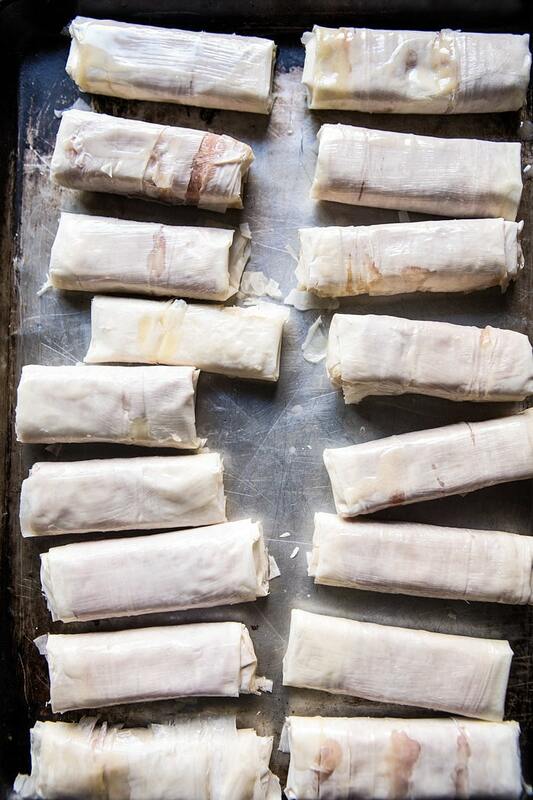 I clearly need to find out a little more info, but the good news is that my Brie rolls travel well and can be baked up just about anywhere there’s an oven…few. I mean we have to have the Brie, it just isn’t Christmas Eve without it. PS. you never know what you’re gonna get with my family…they’re always throwing you curve balls. I’ll keep you updated on the whole Christmas Eve dinner thing, and where exactly all seventeen plus of us end up. If there was ever an appetizer that almost everyone will love, it's got to be these rolls. They're flakey, filled with Brie, salty prosciutto, and finished with a touch of sweetness! 3. 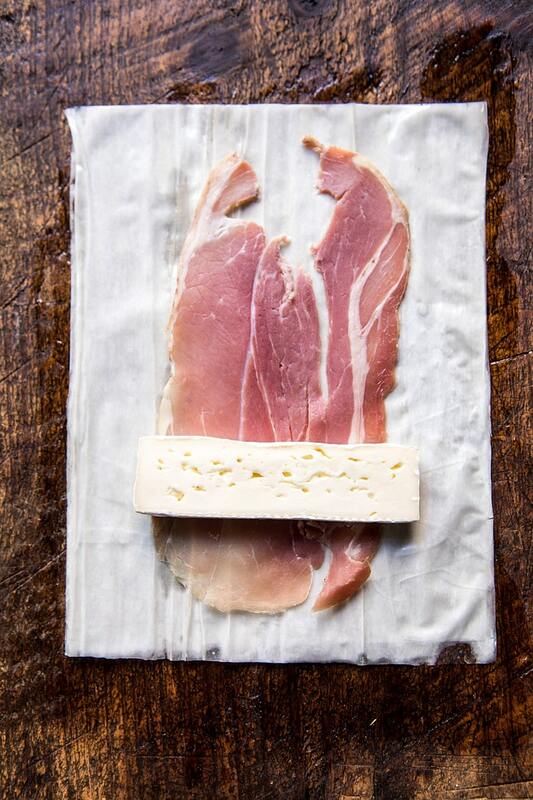 On the short end of the dough, place a piece of prosciutto, then a slice of Brie. Roll the phyllo up over the filling, folding the side edges in to seal, burrito style. 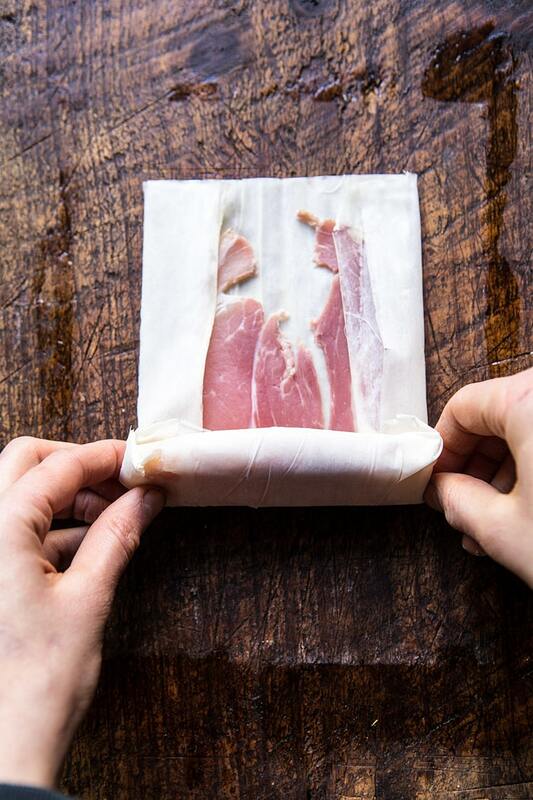 Place the roll seam-side down on the prepared baking sheet and repeat to make 12 rolls total. 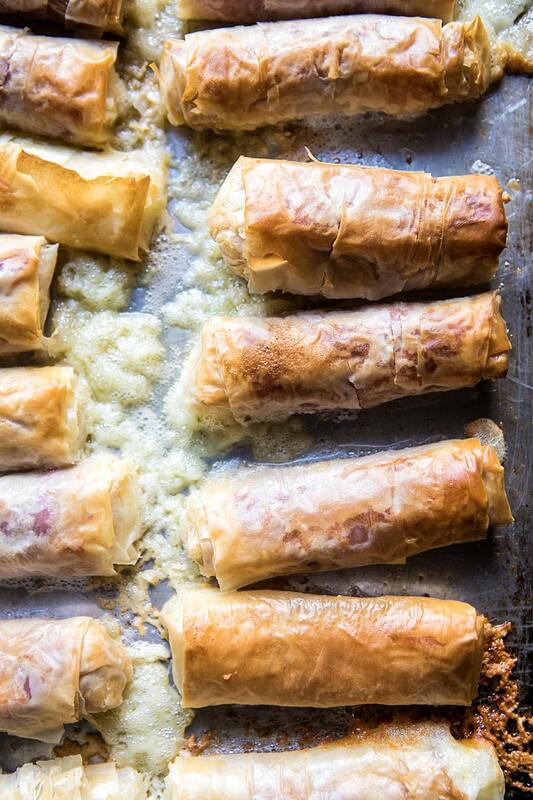 Brush the tops of each phyllo roll generously with melted butter. 4. Bake for 20 to 25 minutes, or until the rolls are golden brown on top. Remove and drizzle lightly with honey. Sprinkle with black pepper, pomegranates, and a little flaky sea salt. Serve warm. 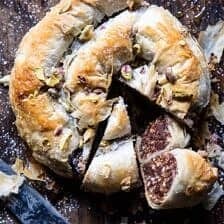 Moroccan Chocolate Almond Phyllo Cake (Snake Cake). 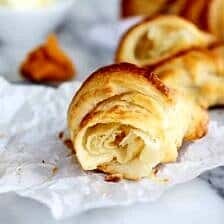 Easier Extra Flaky Homemade Crescent Rolls. I would have to substitute the phillo dough – for some reason I can’t stand the taste of it – but everything else is so spot on it hurts!!! Thanks for the recipe Tiegan! I can’t wait to make these for my family. I’m looking forward to your Christmas dinner spread. I was so inspired by your Thanksgiving one! Thank you Cherie! I am so glad you like this and hope you love my Christmas dinner spread! OOh this would be just perfect for the upcoming parties. Looks absolutely delicious. Yummo!! What would you sign the procuitto for in order to please a vegetarian crowd? I’m thinking fig jelly or maybe some sort of cranberry something-or-other? I hope you love this Kay! Thank you! This might be a silly question – but are these meant to be eaten with/spread on crackers, or just by themselves? Thanks! I like these Brie rolls and think they would be a nice Christmas appetizer along with our usual cheese board! I made my family some baked Brie tonight (with puff pastry, honey, blackberries, and pears), and they loved it! So I think I’ll have to add these little Brie bites to the list, but I agree that too many appetizers seem to fill people up before dinner. Hi Kristin, yes this would make a great appetizer for Christmas! I hope you and your family loves these! We always find enough room for everyone haha it will all work out! The best part is that we all get to be together and in the same place 😊 Thanks! Omg these sounds amazing! I am a vegetarian, but I am sure the ham can be switched out with something else, and it would still be delicious 🙂 Will try them soon ! I hope you love these! Thank you Maja! Thank you Alia! I am so glad you like these! Happy Holidays! What an easy and delicious appetizer! sounds like a great plan to me! Love the pop of pomegranate on that platter too! So happy you like these! Thank you Kristin! Baked brie is just PERFECT for the holidays! I see why they’re the main appetizer attraction, they look amazing! Do you recommend leaving or removing the rind? I can’t wait to try these Tieghan! This is the easy kind of appetizer I need around the holidays! Yes!! I hope you love this Mary Ann! Thank you + Happy Holidays! Made these on Thursday night as a main! Added asparagus, (just the heads) roasted red pepper strip and a tiny bit of red pepper jelly on the inside. Delish !!!!!! That is amazing! Thank you Debbie! Brie and prosciutto wrapped in dough… mmm. What’s not to love? So happy you’re liking these! I hope they turn out amazing for you Nancy, thanks! 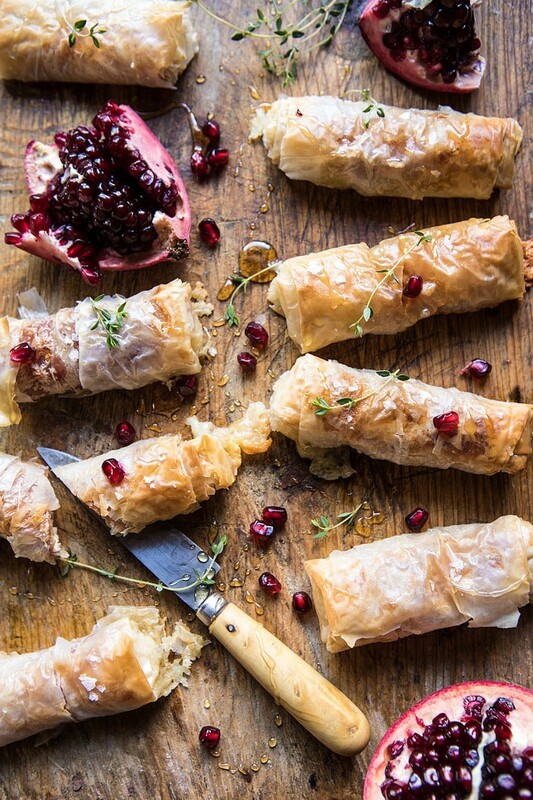 I was wondering since the phyllo is so paper thin, how would just one sheet per roll work?? Every recipe i see for using it,recommens several per roll. Could you please explain if i am misunderstanding, thanks so much! I am so glad you liked these! Thank you! These look amazing! Just wondering how they can be made ahead of time? Should I do all the steps including brushing the rolls with butter, pop them in the fridge and pull them out when I’m ready to bake them? Planning on making these for New Years Eve! PS – love the cookbook! It was a very popular gift in both my family and my in laws… everyone gifted the book to each other! Genius! So simple and delicious. I can actually make these before a party without hurting myself. Can’t wait to try! Haha yes! I hope you love these Lily! Thank you! Thank you Jenn! I am so glad you enjoyed this! Has anyone tried putting the pom jewels inside before baking? Would they go to mush and not be the nice burst of flavor? Also thoughts on a tiny hit of orange zest with the honey? Hey – I was wondering if I could prep ahead of time and then just bake the next day? Thanks! Looks delicious! For Gluten Free use rice wrappers and deep fry instead of baking. Also a pomegranate juice reduction would be yummy. Going to try these next weekend. I’ll rate the recipe after I make them. Is it possible to make these a couple of weeks in advance, freeze, and then pop in the oven? 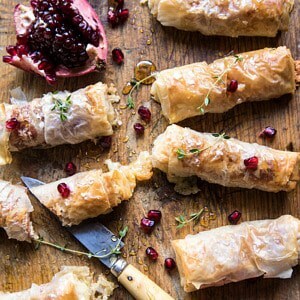 Is it possible to roll the pomegranates inside the roll before baking? Thanks. Happy Thanksgiving!! Can I assemble these ahead of time, refrigerate, and then bake later on in the day? Recipe looks interesting. I’d prefer to see more comments from people that actually made it. Pomegranates look like a garnish and so does the tyme that is not mentioned in the recipe only in the build up. Hi Robert! Many people leave comments based on the post and the photos. I hope you try this recipe! Hi. Can these be prepared ahead of time and refrigerated? I have to drive 45 minutes for a party and would rather pop them in the oven there so they are still warm and not soggy. Could you use thawed frozen cranberries in place of the pomegranates? Or dried cranberries? Delicious! These are so easy and amazing! 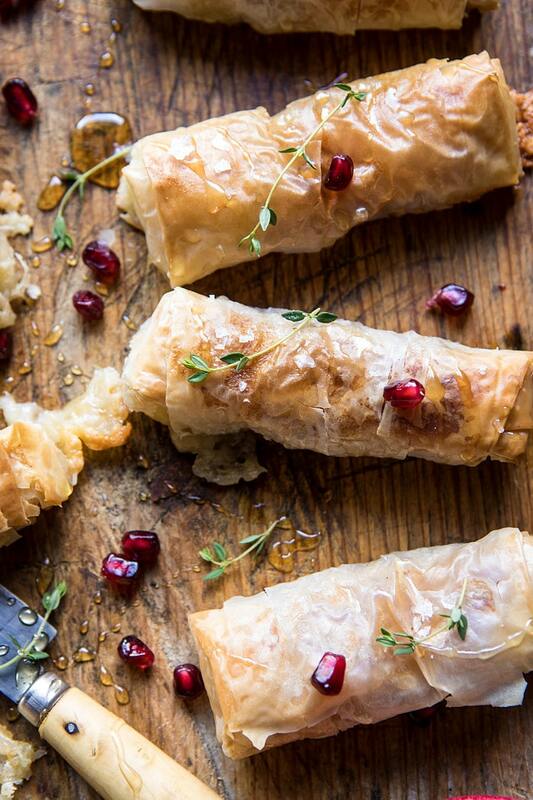 All of your phyllo recipes have made me realize how truly easy and forgiving phyllo dough is to work with! It’s a game changer for me now. 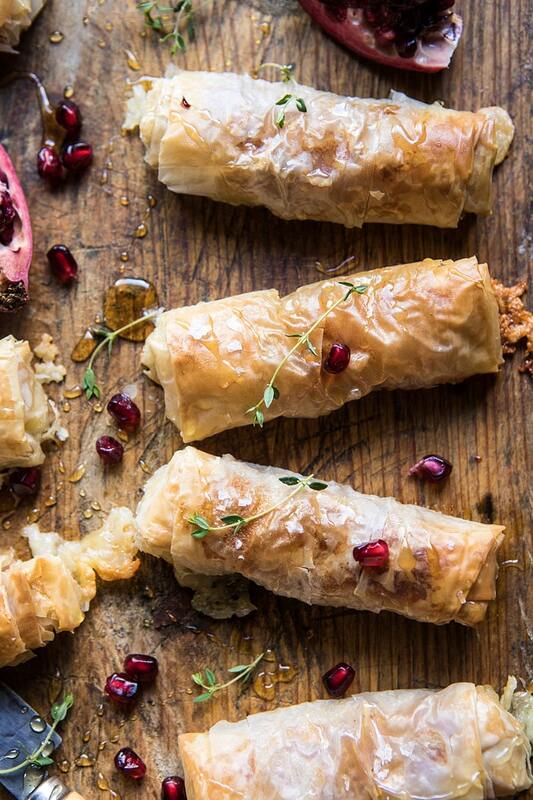 I’ve realize that you can bake just about anything in phyllo and it turns out amazing! Thank you so much! I am so glad you loved this and it turned out so well for you!